Conditur hic Gramus, bello interfectus ab Anglis. Here lies Graham, strong alike in head and hand. The faithlful friend of Wallace. 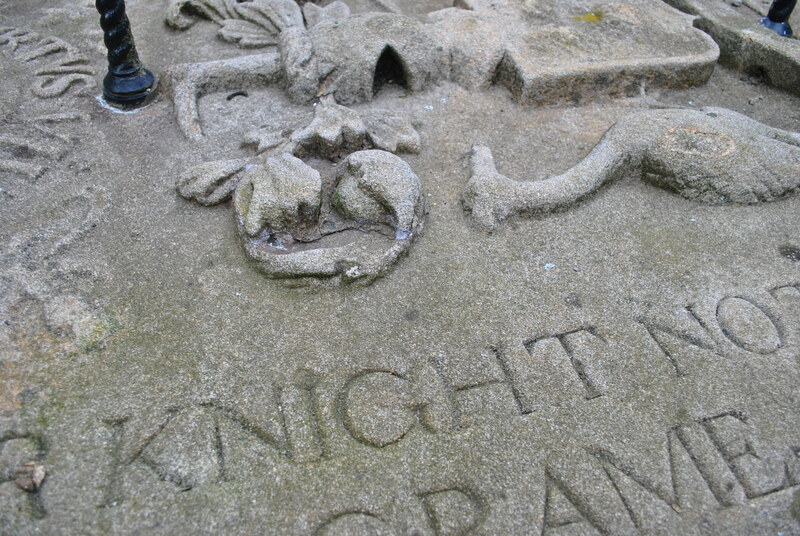 He was slain in battle by the English, 22nd July 1298. William Wallace mourned him deeply. They were close. John was a man he trusted. This able fighter was born to a noble family in the early 13th century growing up in the Stirling area in a Motte and Bailey castle. Sir John met William Wallace when the hero needed help. Wallace was being pursued by English forces, to escape he swam through the river Forth. It was December. His escape rout might have killed him had he not been helped. He was given shelter, warmth and food by the de Graeme family. Wallace and de Graeme will have sat and talked politics by a roaring fire. A few weeks later Sir John and a few of his men supported William Wallace in a fight near Queensferry, they annihilated the English, and continued this small band guerrilla war fare for some time. When at the Battle of Stirling (11th of September 1297) Bridge William Wallace led an army against the English, Sir John de Graeme was part of it, fighting at Wallace’s side and sharing the joy of the victory against the English. The Army of Edward I fought back hard and defeated the Scots at the Battle of Falkirk (22nd of July 1298). 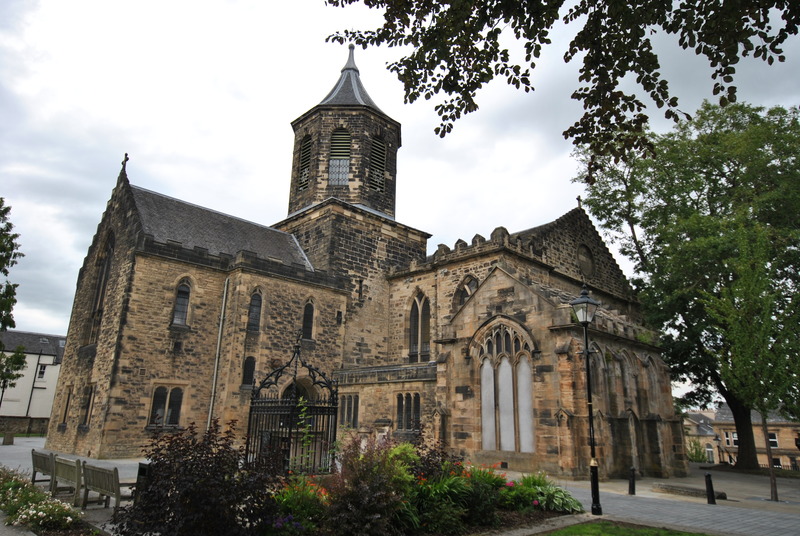 Sir John de Graeme was killed by an English sword and Wallace carried his friend to the Parish Church of Falkirk where he was buried. “They carried him with worship and dolour – Into Fawkyrk graith o’ him in sepulture.” wrote the Scottish poet and minstrel Blind Harry in his epic poem The Wallace in 1477. The wrought iron structure was placed on the tomb in 1860. 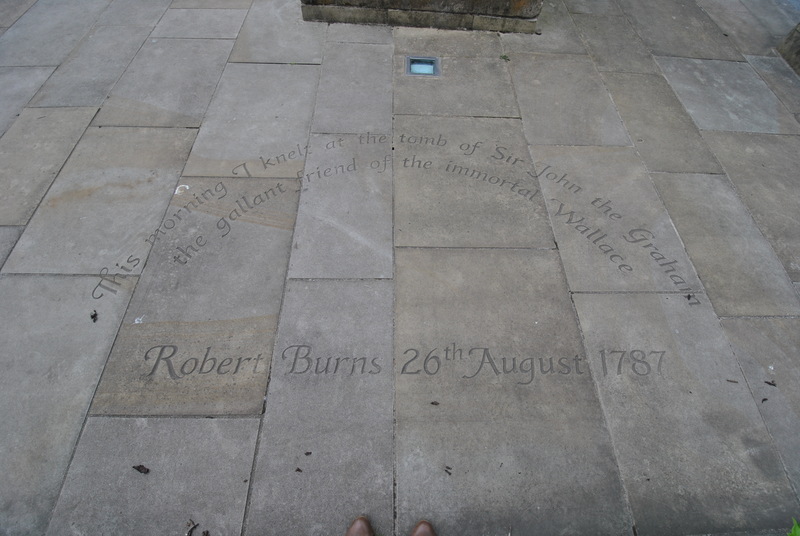 Robert Burns visited the grave and knelt in reverence for the “gallant friend of the immortal Wallace.” The sword is a replica. “Falkirk”. Statistical Account of Scotland 19. 1791–1799. p. 100. An excellent article about another great Scottish hero. Still more research to be done on confirming the actual battle site. Recent archaeological find of horse furniture should help. This reportedly had a red chevron Which reopens the enigma of Bruce being present at Falkirk. The replica sword took a while being produced. A welcome addition to the tomb. Authenticity of Graeme sword Seems to be accepted while origins of Wallace sword still challenged.